Almanac Dance Circus Theatre forges ensemble-driven performances that fuse acrobatics, storytelling, and daring physicality. In our youth programming we focus on cooperation, trust, and empowerment as demonstrated through the acts of physical risk-taking and original artistic creation. "Dance Circus Theatre" means we take the essential parts of those three genres and combine them to craft a new hybrid: We are theatre in our understanding of storytelling and character, dance in our attention to bodies and rhythm, and circus in our use of movements that aren’t just beautiful or graceful but visibly difficult to achieve with a real risk of failure. As an ensemble we are always challenging ourselves to be more trusting, more rigorous, and more daring, and through our workshops and performances we invite our student audiences to seek out those same qualities in themselves. 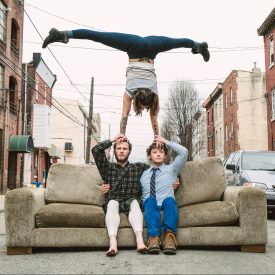 Called “The little dance theatre troupe that could” by Philadelphia’s City Paper, Almanac Dance Circus Theatre was founded in 2013 by Nick Gillette and Ben Grinberg, graduates of the Pig Iron School for Advanced Performance Training, with Adam Kerbel, a graduate of the Headlong Performance Institute. The company pursues present performance at the edge of what is possible, through playful honesty. Almanac has performed for tens of thousands across eleven states and in Mexico, from street fairs to the Philadelphia Museum of Art, from elementary school assemblies to private parties and events. They were selected as 2013–2014 Fresh Tracks Artists at New York Live Arts, were the first resident company at the Philadelphia School of Circus Arts, and are artists-in-residence at Mascher Space Co-Op. Their work has been presented by FringeArts, Trinity Rep, the International Festival of Contemporary Dance of Mexico City, the Faux/Real Festival, Colgate University, Reading Terminal Market, Bearnstow, Pig Iron Theatre Company, Lois Welk, Circus Now!, the University City District, Automatic Arts, and New York Live Arts, and many others, including as special guests of Bill T. Jones with the Bill T. Jones/Arnie Zane Dance Company at the NYLA Gala (2014). Full-length productions include An Homage to Whatshername and A Door in the Desert (upcoming, 2017), Exile 2588 (2016), Leaps of Faith and Other Mistakes (2015), The Fleecing (2015), Nightfall (2014), and Communitas (2014).